Poisons come in many forms from household chemicals to snake bites and teaching people especially child to stay away from such things can be difficult. Of course chemicals can be kept behind lock and key and you can teach most anyone to just stay away from things like snakes. But what about the less obvious stuff like poisonous plants? Sure everyone has heard someone say don’t eat that it’s poisonous or you shouldn’t keep this or that type of plant in your house if you have kids, but what about plants that grow wild? That is a whole different story. How many times have you seen people, mainly kids, innocently put different types of plant parts in their mouth? Maybe a grass stem like you see in old movies, small sticks or even someone collecting herbs or berries, all of these happen all the time. And for the most part even if you accidently eat something that is poisonous you will probably be fine, you might have to go to the hospital but fine never the less. Now the other side of this is the absolutely toxic plants that can and will kill you if eaten in a Credit: http://cal.vet.upenn.edu/projects/poison/plants/ppwater.htm large enough quantity. And the scary part is with some plants toxic levels come from very small amounts. At this point you are probably thinking sure this might be true but how many plants are really this toxic and how many of those do I even need to concern myself with they probably don’t even grow where I live. 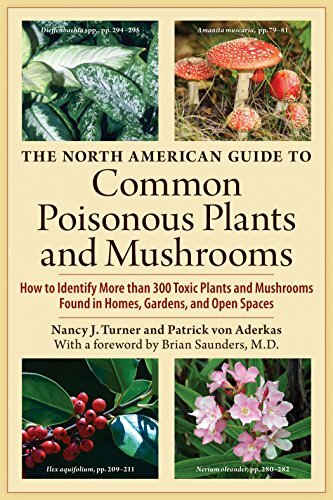 Well you might be surprised to know that there is at least one plant that is this toxic and it grows throughout all of North America. This plant is the Water Hemlock and it is considered by the United States Department of Agriculture (USDA) to be “the most violently toxic plant that grows in North America”. What is the Water Hemlock? The water hemlock (Cicuta maculata) is a perennial and member of the Umbelliferae family. It is a wetland plant and is typically found in poorly drained fields and pastures and along the banks of ditches and creeks. It can grow any where from two to six feet tall and has small veiny serrated leaves, hollow purple streaked stems and small white flowers that grow in umbrella like clusters. It is commonly mistaken for a number of other harmless plants including wild parsnip and other herbs. Every part of this plant is highly toxic and when the hollow stems or leaves are broken the plant releases a yellowy brown liquid that is highly concentrated with the toxin Cicutoxin. Cicutoxin is an unsaturated alcohol that affects the central nervous system and when ingested causes rapid breathing, excessive salvation/frothing and violent convulsion which ultimately causes death by asphyxiation. The toxicity of this poison is so strong that it can kill an adult within fifteen minutes of consumption which makes treatment very difficult. The USDA recommends spraying or grubbing out the plants. If spraying they recommend using the common herbicide 2,4-D and to repeat treatment until eradicated. Now if you choose to grub these plants out you must be very careful. It is recommended that you do your best to protect yourself by wearing gloves, long sleeved shirts, long pants and face and eye protection. Also you must remove the entire plant roots and all then burn them. In conclusion it is highly recommended that if you spend any amount of time in the outdoors that you should learn to identify the Water Hemlock. There are many good resources online that go into great detail showing you every aspect of the plant. A few such sites including http://cal.vet.upenn.edu/projects/poison/plants/ppwater.htm, http://www.wildwoodsurvival.com/survival/food/poisonousplants/waterhemlock/index.html and the USDA site at http://www.ars.usda.gov/Services/docs.htm?docid=9996 which also has information on many other poisonous plants you might want to educate yourself on.